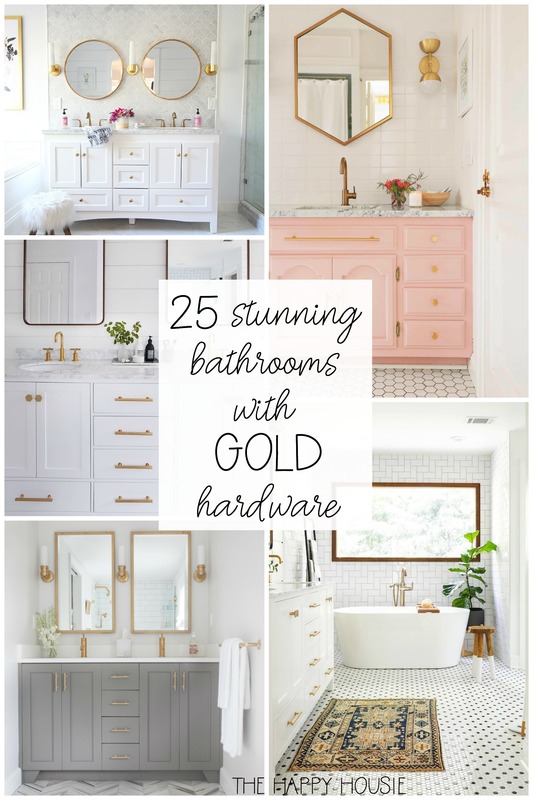 Today I’m sharing some stunning bathrooms that all feature gold hardware and/or gold bathroom fixtures. As you may know we are currently in mid-renovation of not one but two bathrooms. 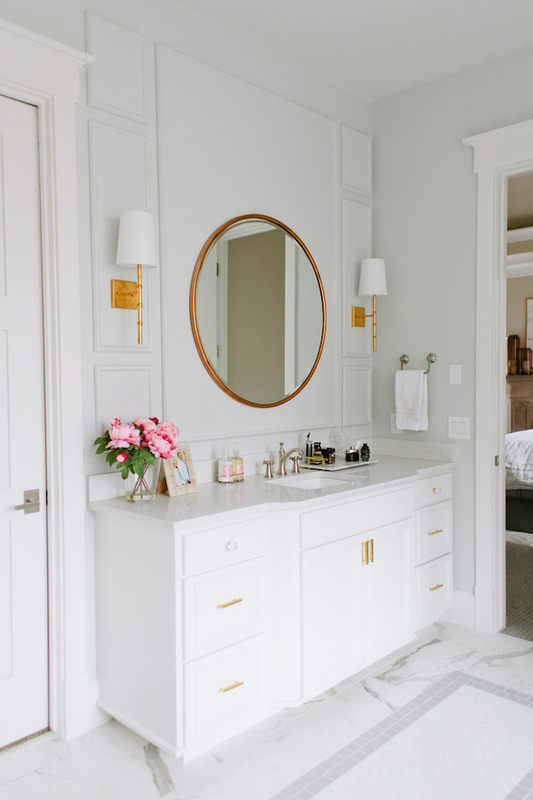 We’re talking pretty major renovations. Like, take out and rebuild walls and cut out the plywood floor and move plumbing and drains and vents kind of renovation. 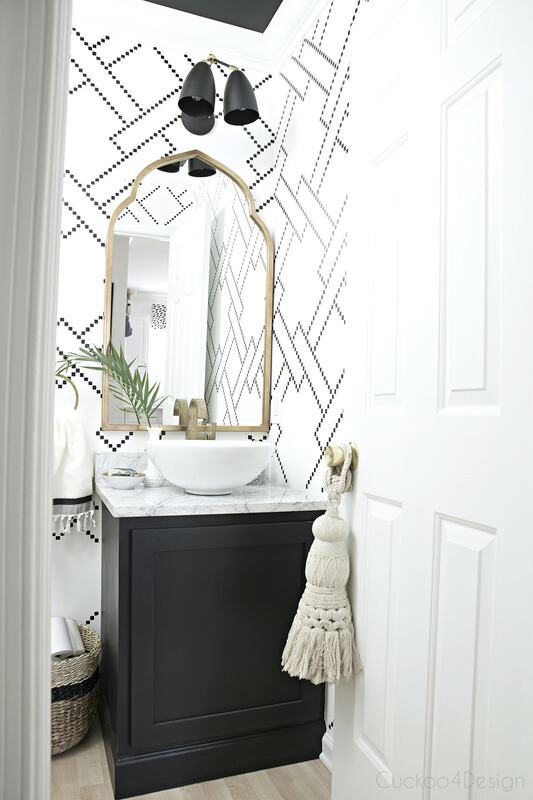 So… as I take a little break from cleaning up and vacuuming and wiping off the drywall dust that has permeated our main floor, I’m searching for inspiration and trying to make some final decisions on the design of these two bathrooms. 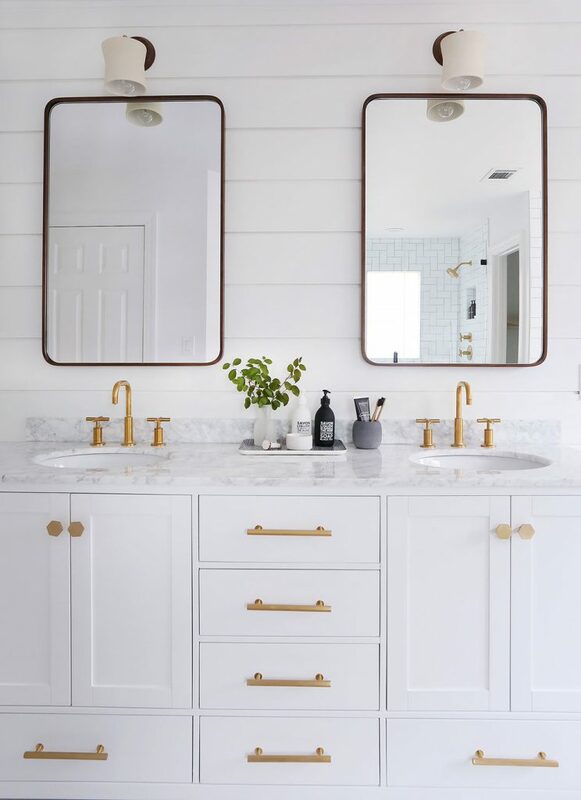 There are a few design trends that keep popping up in the images I’m loving on Pinterest (see my bathroom board here)… and one of them is definitely GOLD. It has made a huge comeback, friends. And not just gold. But brass, aged brass, and all things warm metal. I have to admit that, after years of complete dedication to chrome and nickel, I would have never believed that I’d like gold again. And not just like it… but love it! 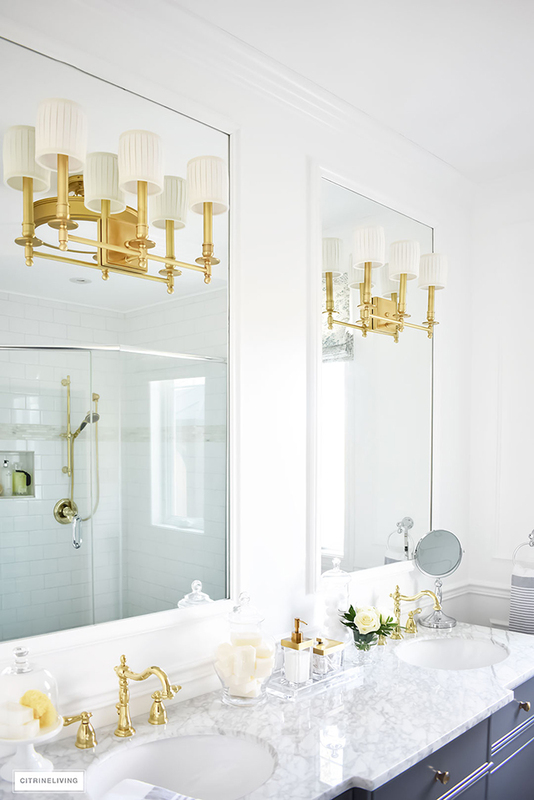 I really want to integrate gold finishes into one or both of our bathroom makeovers, but I’m also nervous about committing to warm metal hardware and fixtures in such an expensive place as the bathroom. Eek! 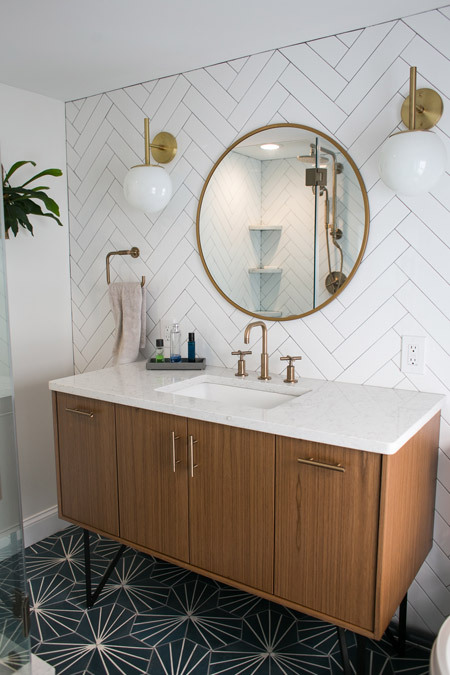 Some of the owners/designers of these stunning bathrooms have used gold throughout in cabinet hardware, lighting, and plumbing fixtures, while others have mixed gold with other metals. Which do you prefer? All one metal, or mixed? Why? 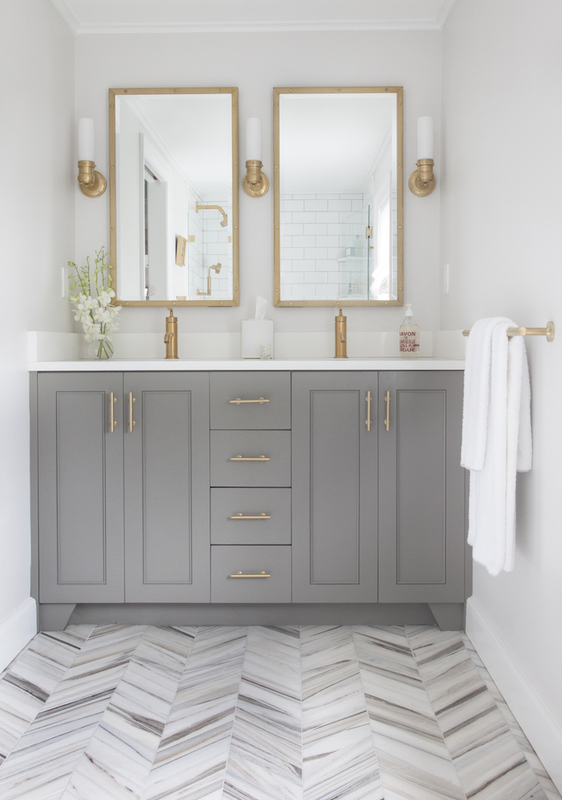 I love the way that each of these gorgeous bathroom spaces feature gold in cabinet hardware, lighting, and even bathroom fixtures, but I’m still nervous about a total commitment. What do you think? Would you try it? Did you find some inspiration? Pin it to remember it! NEVER FOLLOW TRENDS!!!!!! Always follow your heart and what you love. 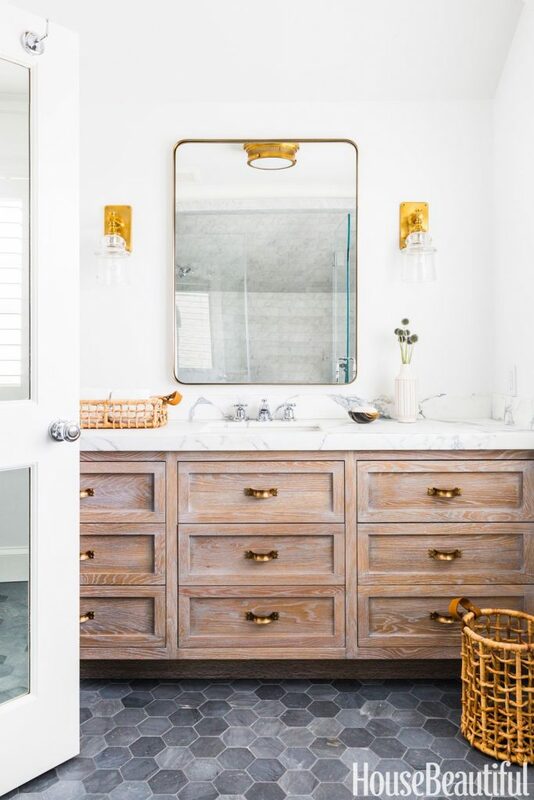 I have kept the gold and brass and copper and silver around in my home for all my housekeeping years and I never change because of the trends. I mix all however it pleases me and I’ve gotten many comments on how lovely everything looks. 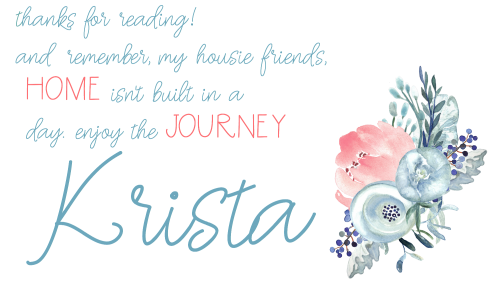 I am very creative and decorate with vignettes as I always have. All of this is nothing new to us “old timers”. 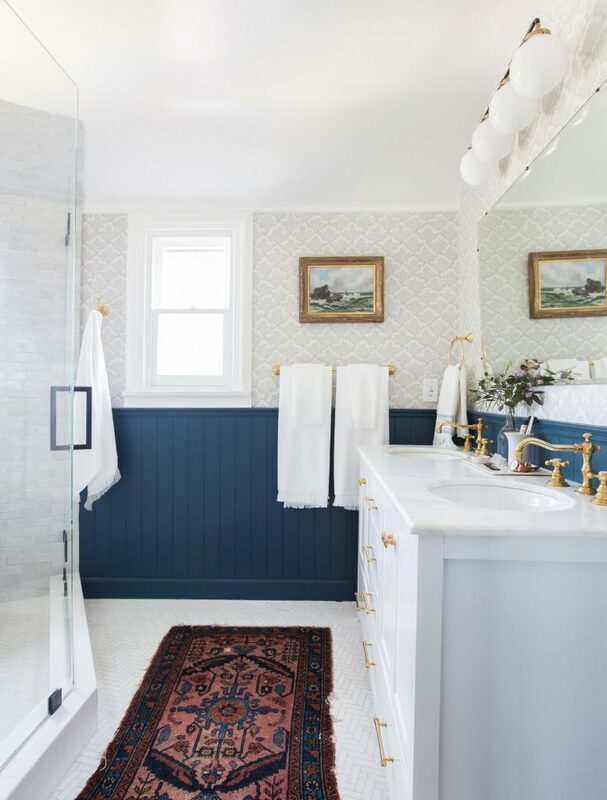 Same with all this farm house country kitchens and white painted cabinets. Everyone acts like its something new and its been around forever. It all comes back. LOL. 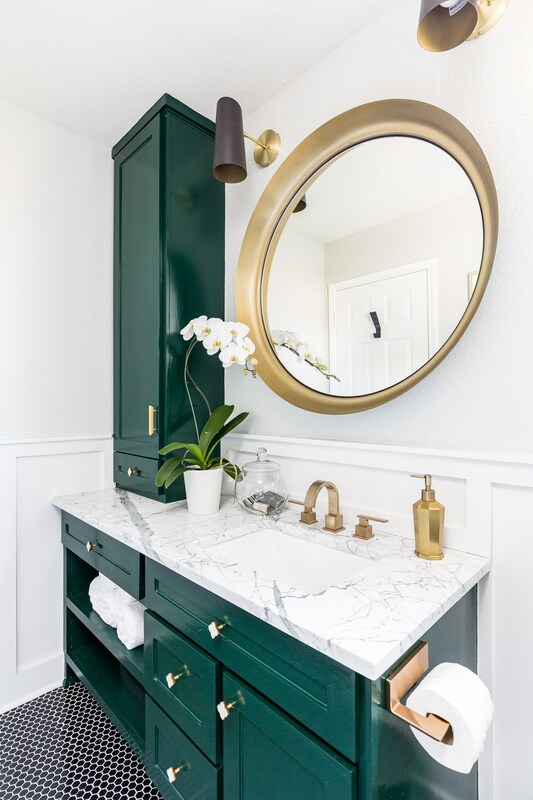 Those oak cabinets that everyone painted white, in a few years they will be trying to figure out how to strip them back to the oak!!! Just do what you love, and you will love it all the time!!! My parents have gold bathroom faucets and shower heads, but after 20 years of use they are looking pretty bad. They show signs of wear in places. I personally would not pay the difference unless I wanted to change out everything every 10 years or so!!! This is ALL my opinion, but I am a happy, very satisfied, confident 63 year old not trying to keep up with the Jones’s or the Smiths!!!! I live very comfortably!! 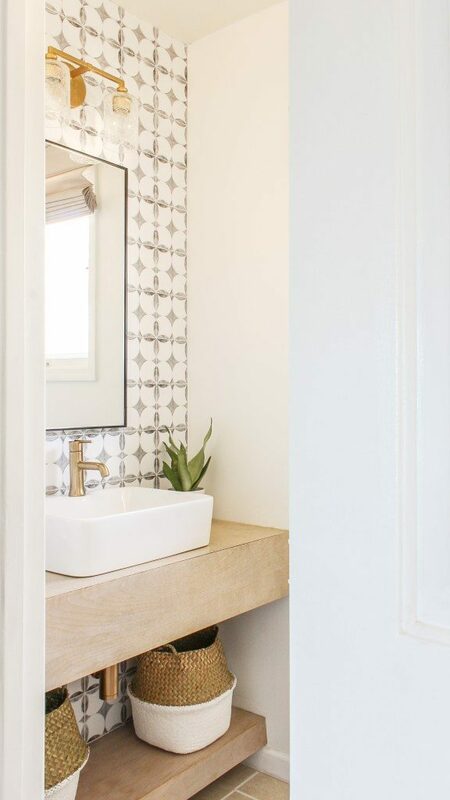 I believe in doing what makes the homeowner happy when they live in the room. 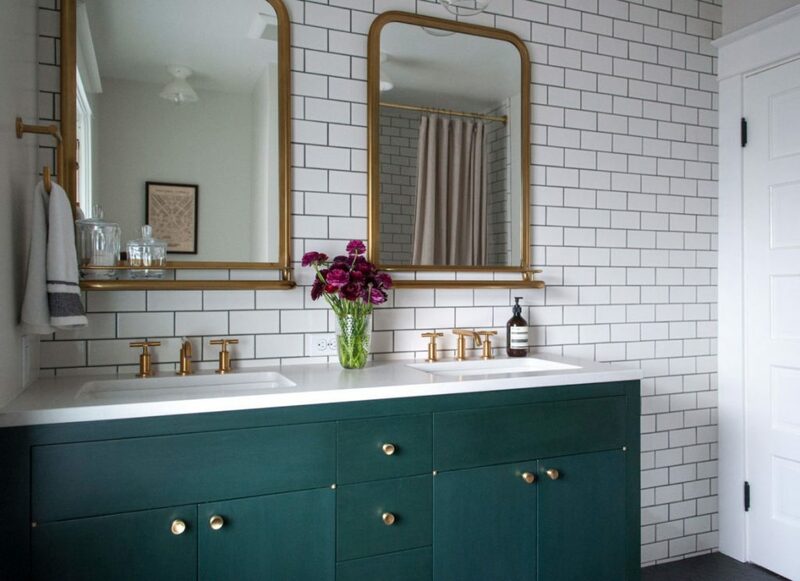 I used two toned in my bathroom (American standard Williamsburg), brass and chrome because I really like it. I have gotten flack from friends about it but I just like it. 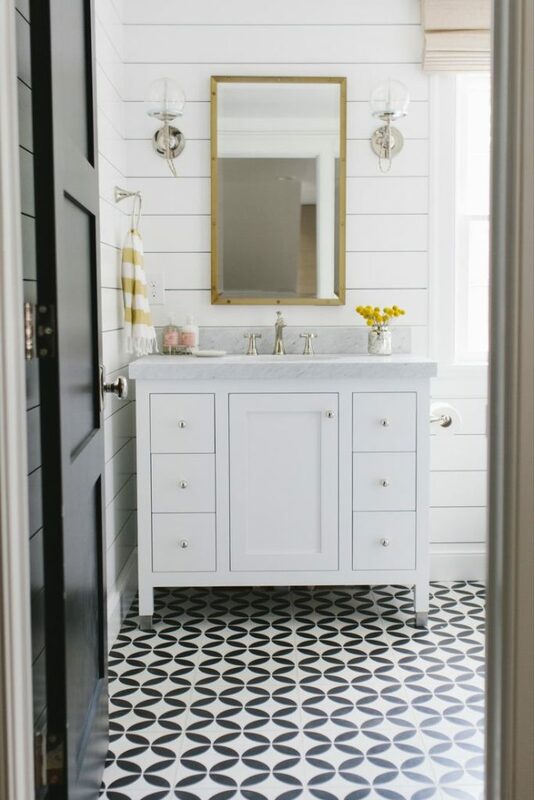 It’s a small bathroom, not very well lit and I think the shine brightens the room up. 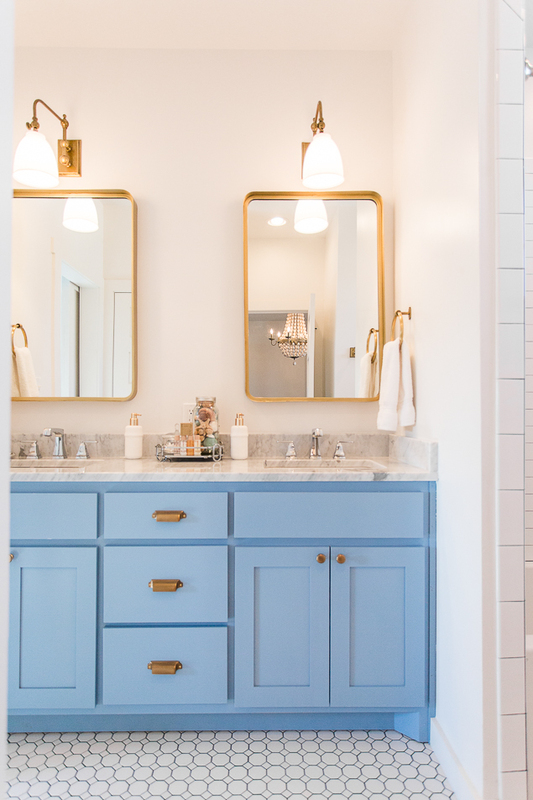 The two tone makes it easier to match on items that have to be one or the other. In my kitchen it’s nickle because I found a used unique sink I love very early into renovations and that set the tone as I did everything else in there and will probably remain so for a very long time as I’m sick of working on the never ending kitchen. 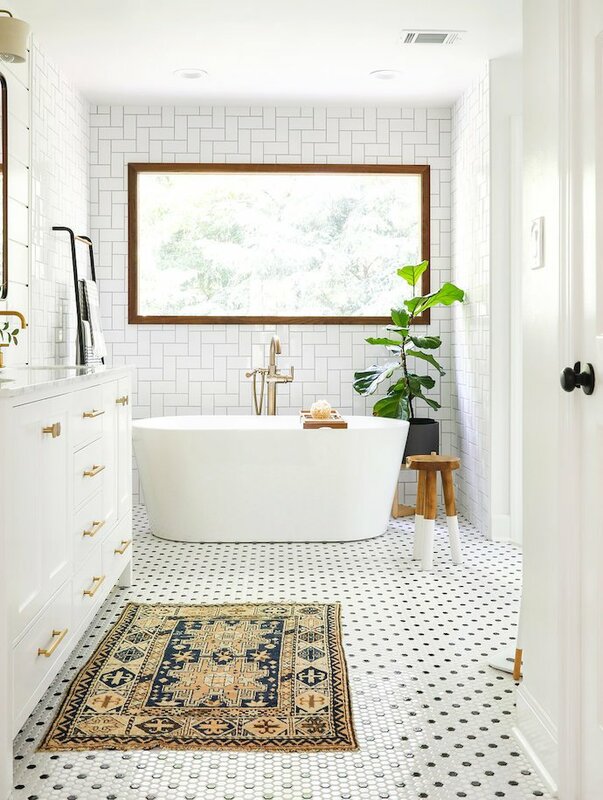 My master bedroom is brass due to a very unique light fixture that I really like (stained glass). The rest of my house is oil rubbed bronze where metal is practical. It hides dirt and it’s less sensitive to bumps/scratches. I grew up on a old farm and the oil rubbed finish reminds me of sunny happy days in the barns when I was younger. 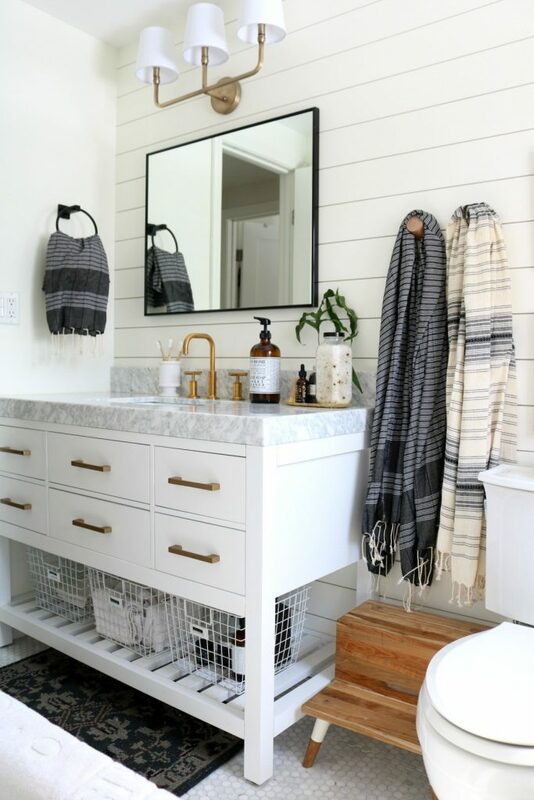 I have a 200 sq ft great room on the back of my house left to do and I know I want the outlet covers to be almond instead of metal since there’s less heavy traffic in there. The doors in the great room are old simple victorians with etched glass I rescued from a dumpster, very sturdy. They all have very strange (keyed)locks so the metal finish in there may be decided by the locksmith who comes to work on those locks 😉 i hung them with no strikes cut out so the locks don’t cause an issue. 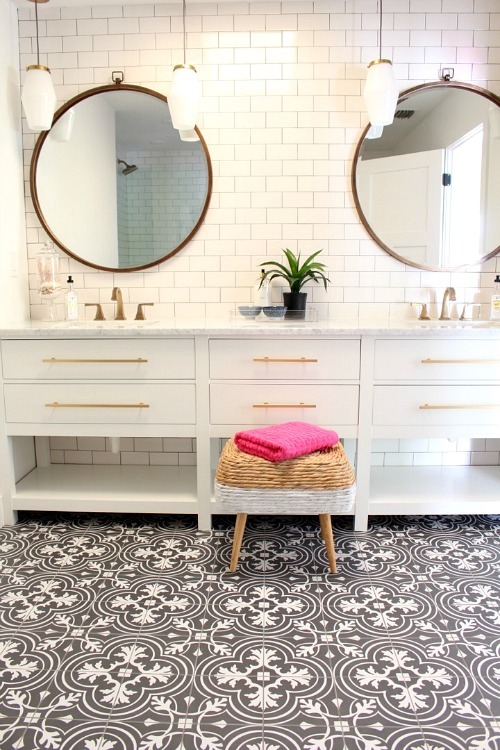 Interesting how things come back win style – but a little different. 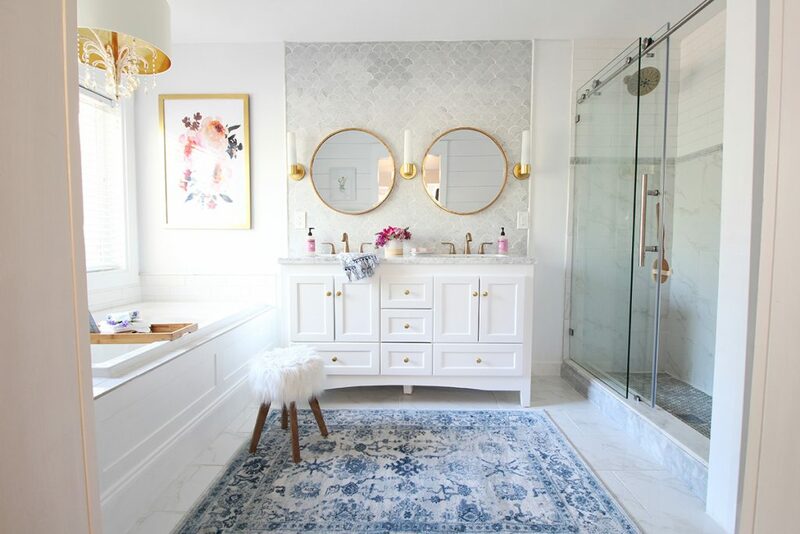 I can’t wait until you reveal your bathrooms! Looking forward to seeing what you do. I will admit that “trends” frustrate me. 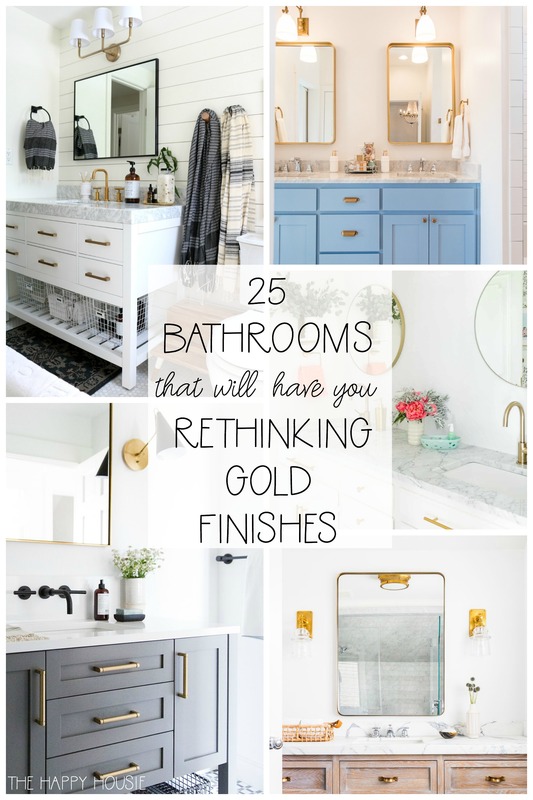 For the past few ears, it’s been all about getting rid of or painting the shiny and antiqued brass from the 80’s and 90’s and switching over to oil rubbed bronze and brushed nickel, then brushed gold is introduced, and now it seems all shades and finishes of gold are a new trend (or fad?). 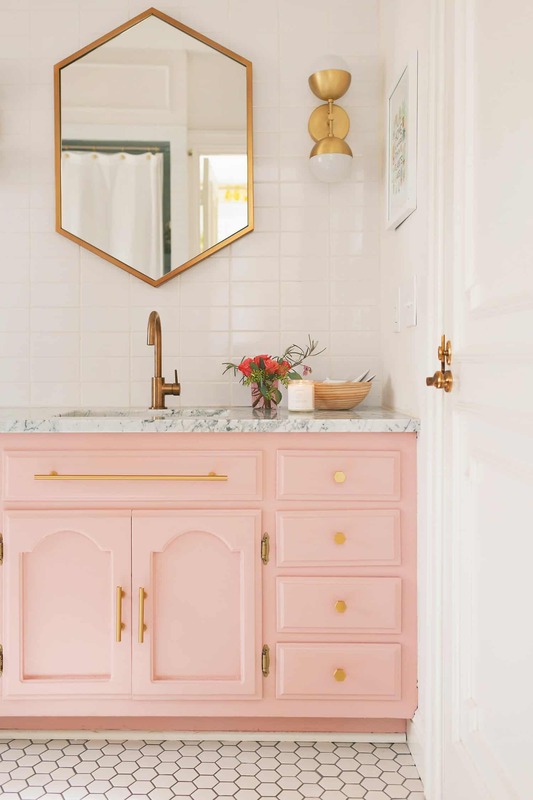 As someone who is starting a home staging business, I would anticipate that I would be recommending clients get rid of the old brass to update their home. 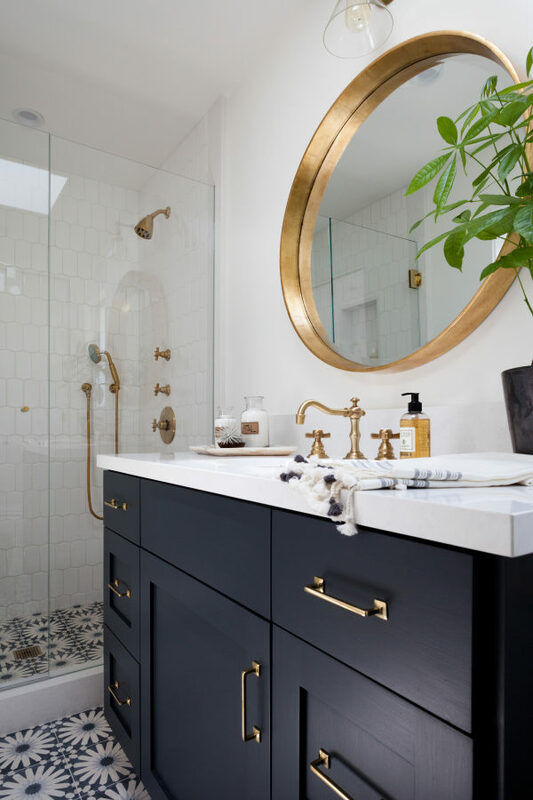 Antique brass, I feel, is more classic and liveable, so personally, if it were me I would go that route, and it could mix well with oil rubbed bronze faucets. 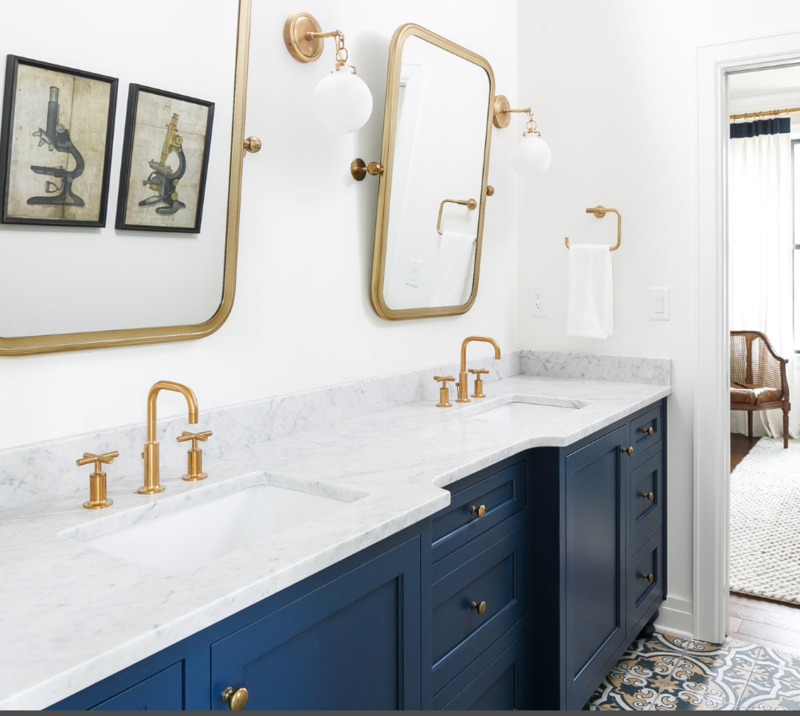 Or maybe brushed gold cabinet hardware with brushed nickel faucets for a two-tone look. 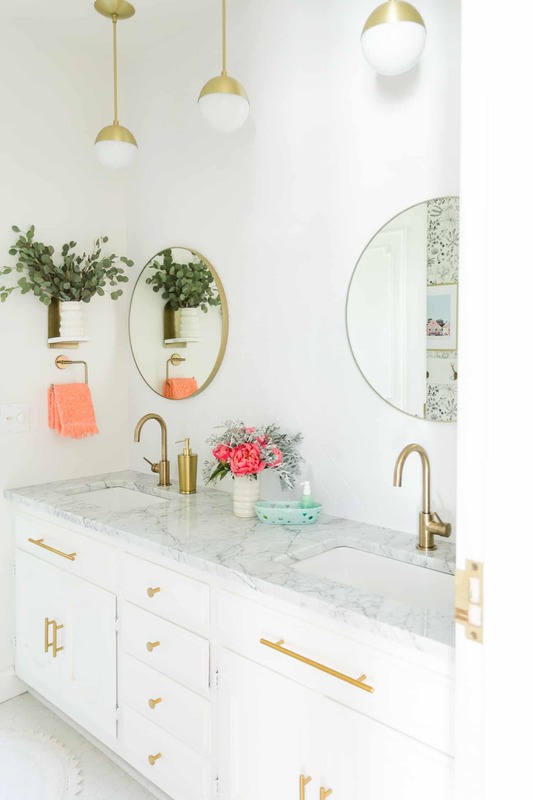 I would incorporate gold in the form of cabinet hardware and decorative accessories that are easier to change. Because of the expense to change these items, I would not go gold. I don’t think it will be a lasting design. 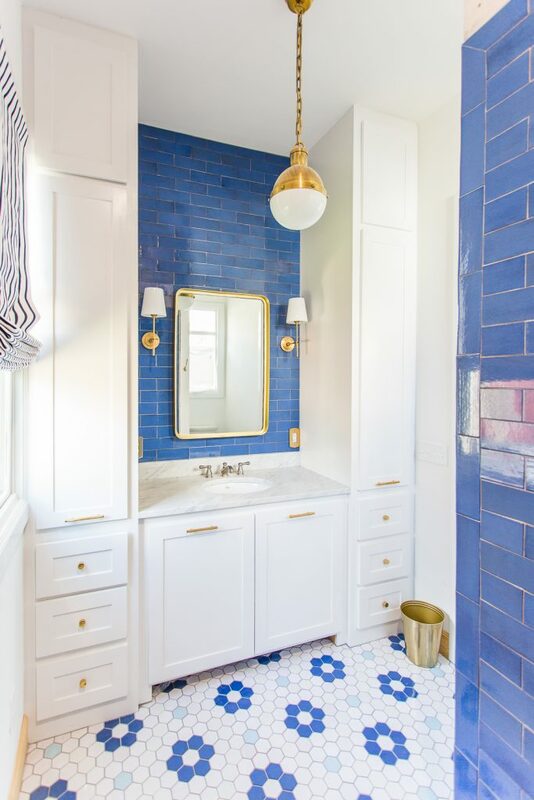 I do like the look, but I would not want the expense of having to change it out in ten years. 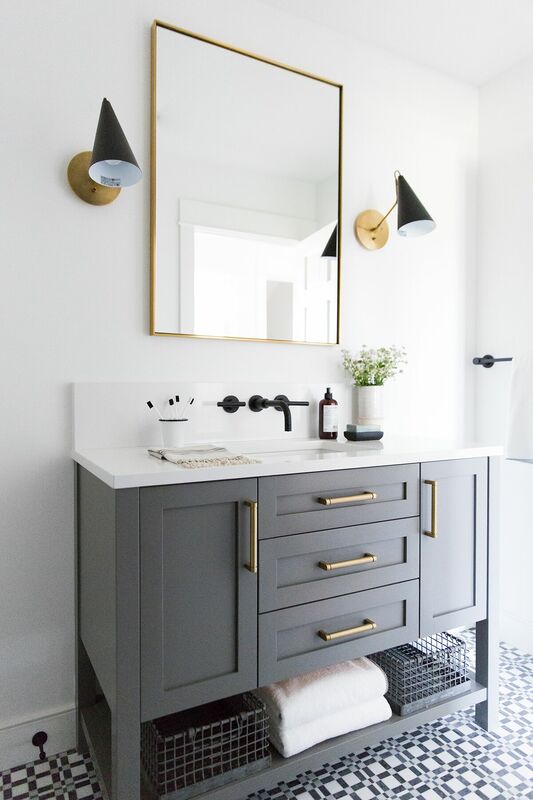 I have seen chrome fixtures with gold accents and I like them and I think they could transition either style. I really don’t like the gold. 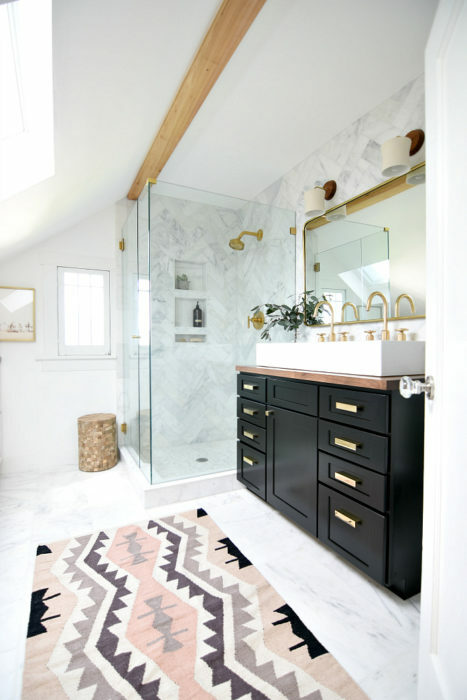 I like everything else those bathrooms have. I just don’t like the gold. Really looks like my gramas house.